Ogunquit Performing Arts opens the romantic month of February with Frank Loesser’s award-winning, colorful hit musical, “Guys and Dolls”, starring Marlon Brando, Jean Simmons, Frank Sinatra and Vivian Blaine, with exciting dance numbers by Michael Kidd. 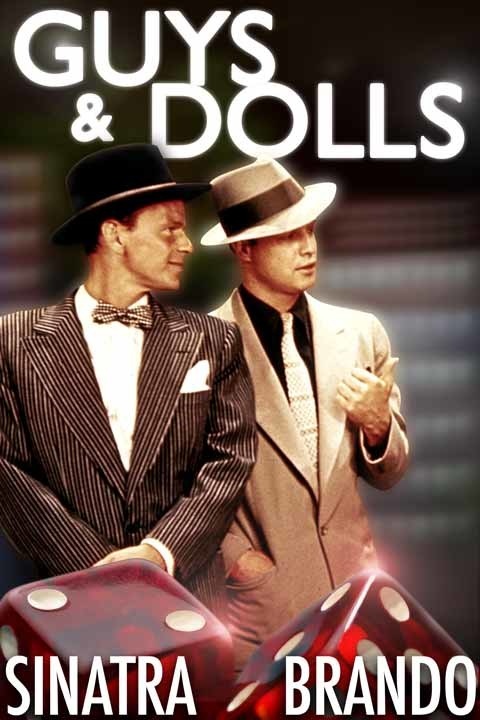 Marlon Brando and Frank Sinatra are the guys, and Jean Simmons and Vivian Blaine are the dolls in Frank Loesser’s hit musical “Guys and Dolls” to be screened on Sunday, February 3, 2019 at 2 pm, at the Dunaway Center, 23 School Street, Ogunquit. Presented by Ogunquit Performing Arts with free admission, parking and popcorn. “Guys and Dolls” is a fable about gambling men, and the women who try to tame them. Set in the showy, seamy world of New York’s Times Square in the mid-20th century, the flashy and witty “Guys and Dolls” is populated with gangsters and gamblers, thugs and mugs, missionary dolls and scantily clad showgirls, and one of the great musical scores in the history of American theatre. Based on the short stories of Damon Runyan, and with music and lyrics by the legendary Frank Loesser, the original production of “Guys and Dolls” opened on Broadway November 24, 1950, and ran for 1200 performances. The film version, starring Marlon Brando, Jean Simmons, Frank Sinatra and Vivian Blaine (recreating her stage role as Adelaide), had the highest box office gross of 1955. The film also features Stubby Kaye, B.S. Pully, Johnny Silver, and Sheldon Leonard. Join us for this fabulous musical comedy! “Guys and Dolls” will be screened on Sunday, February 3, 2019, at 2 pm at the Dunaway Center, 23 School Street in Ogunquit. The film is shown on a full wall-size screen; admission, parking, and popcorn are free!